The two teams that met in the one of the most charged local derbies of all time in the Champions League final of last season clashed again on the European stage in the quarter final this time around. Last season was the breakout year for Atletico, as they won La Liga, and went all the way to the Champions League final. That, however, was where it ended for them, with their eternal rivals Real Madrid beating them in heart breaking fashion to lift La Decima. This season was a totally different story though, with the European champions failing to record a single victory over their rivals. Both sides came into the game pretty evenly matched, and left quite the same. Atletico: 13. Oblak; 20. Juanfran; 23. Miranda; 2. Godin; 3. Siqueira; 10. Turan Arda; 14. Gabi; 4. Suarez; 6. Koke (F. Torres 82′); 7. Griezmann (Raul Garcia 76′); 9. Mandzukic. Real Madrid: 1. Casillas; 15. Carvajal (Arbeloa 84′); 2. Varane; 4. Ramos; 12. Marcelo; 19. Modric; 8. Kroos; 10. James; 11. Bale; 9. Benzema (Isco 75′); 7. C. Ronaldo. A lot of pundits have been quick to decry the 4-4-2 of late, stating the oft stated argument that it leaves a team too short staffed in the middle of the park. Obviously, the pundits haven’t really watched Atletico Madrid play too much. 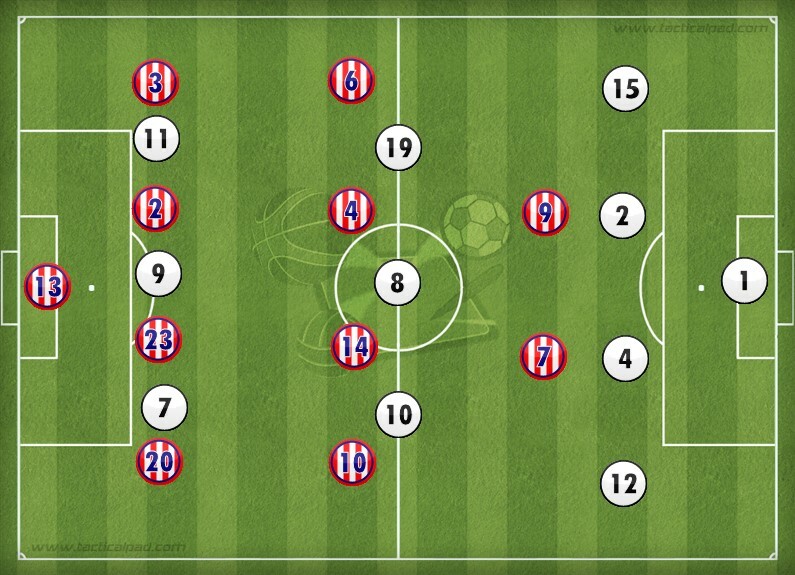 The Rojiblancos almost always line up in a 4-4-2 shape, and are never really outfought in the middle of the pitch. This is mostly down to the fact that their midfield is very narrow, very tight, and very compact. The space between midfield and defence, and between the midfielders themselves are seldom exploited or occupied, because of the intensity with which they attack the ball. This pretty much forces the opposition into the wide areas. Even there, it is often impossible for the attacking team to cut inside and move the play to the center, with two players blocking the route (full back, and wide midfielder). This is when the central midfielder provides half cover for the full back, so as to intercept any runners who make runs behind the full backs. This is why a lot of their ball recoveries are made in wide areas. 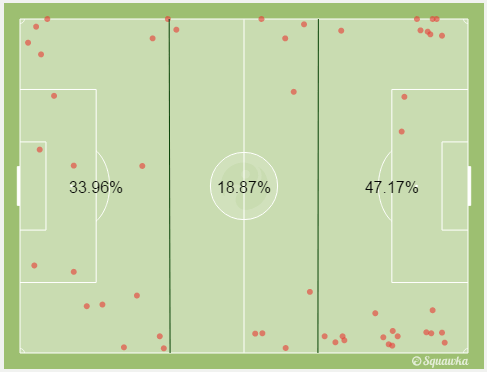 Atletico winning a lot of the ball in wide areas. It was no different against the Galacticos of Real Madrid, with the likes of Marcelo and James suffering at the hands of this smothering defence. Real’s right side though, was far more productive, with Mario Suarez often struggling to contain Modric and Carvajal, who was finding space to make runs on the outside. This was especially noticeable in the early stages of the game, but Atletico eventually got a hold of that side, with Siqueira also going on to attack later on. Based on how Atletico played over the course of the entire game, one is tempted to think that Simeone deliberately instructed his team to pace themselves and brace for a charge in the second half. The home team was pretty quiet in the first half, and Real bossed proceedings. 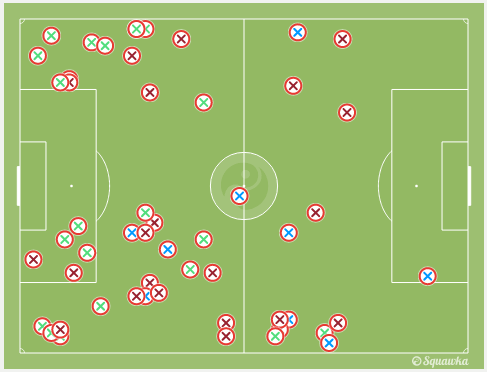 Atletico sat back, and weren’t as aggressive on the press, with a lot of the play in front of their midfield. During this period, the Atletico full backs too, were very defensive, with neither of them really making an advance into the opposition half, or threatening to turn the opposite numbers. The standard attacking ploy during this period was the long ball down the throats of the centre backs to Mario Mandzukic. This resulted in an interesting battle between the Croatian forward, and the shrinking violet, Sergio Ramos. While it wasn’t really a very coherent attacking tactic, and didn’t really result in any clear cut opportunities, it created some space for the energetic Antoine Griezmann to exploit. The second half saw Atletico become much more prominent in the game as an attacking force, especially towards the end of the game. As the Real Madrid side was tiring, Atletico began their assault on the opposition goal, with quite a few balls into the box. Raul Garcia and Fernando Torres also came off the bench, as Atletico looked for a winner late in the game. The catalyst for this attacking football were the full backs, who displayed a lot more attacking intent in the second half. For the first time in the game, Real’s full backs were being turned to face their own goal. Marcelo was frequently caught too high up the pitch, and Ramos was often moving across to cover for him. The problem was compounded because James, the midfielder on that side of the pitch, wasn’t as effective defensively as Modric. As a result, a lot more crosses came from the right hand side of the pitch (11 vs 7), with 4 of them coming from Juanfran. With Mandzukic, Torres, and Raul Garcia in the box, this made Real very uncomfortable, with the defending champs facing some uncomfortable moments towards the end of the second half. Atletico attacking from the wide right. The Atletico set up, though effective, is one that is fairly predictable. The narrow nature of the midfield means that teams should look to attack down the flanks, where there is space to be had. Of course, this is easier said than done, due to the nature of the aggressive pressing in midfield from Atletico, and their ball winning tactics out wide. 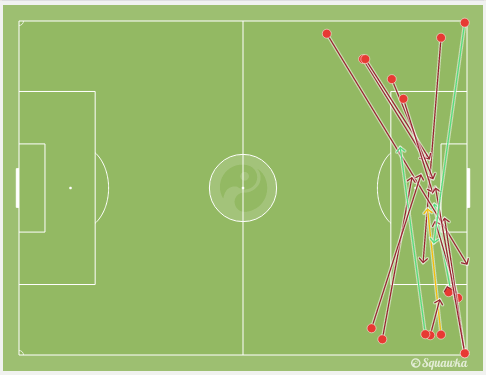 Keeping that in mind, Real did a fair job of taking the game to Atletico, especially in the first half. The first difference was that Real didn’t line up in the 4-2-3-1 formation, but began with something closer to a 4-3-3. James, Kroos, and Modric started in midfield, with Kroos playing the role of the deep lying playmaker. The defining feature here was how wide the two central midfielders ahead of him were. You’d normally see such positions being adopted by the two wide midfielders in a diamond. Average position of Real players. As you can see above, the two players who are nominally central midfielders (James and Modric) have wider average positions than the two players who are nominally wide men (Ronaldo and Bale). Having the midfield trio so spread out made it really difficult for Atletico to press them with real intensity and in numbers. Three in midfield also allowed Real to throw their full backs forward with some cover at the back in case Atletico did manage to break. Playing wide also allowed them to support the wide men, who were looking to break down the flanks. The Modric-Carvajal combination did particularly well in this regard, as they managed to attack Siquiera on a number of occasions. 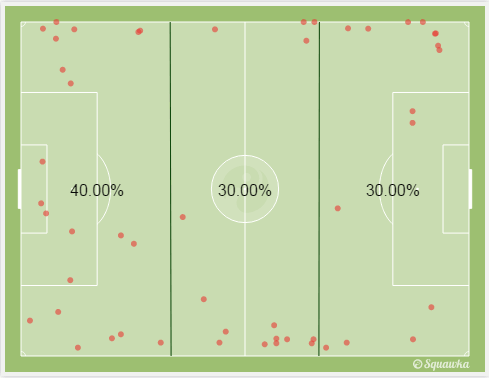 In fact, Modric to Carvajal, and Carvajal to Modric were the two most frequent pass combinations in the match. While they tried to replicate the same approach on the left hand side, it simply didn’t work. Turan Arda was far more aggressive with James, and Marcelo couldn’t really get forward as often. Of course, the pattern was reversed in the second half, with the Atletico full backs making their way forward at every opportunity. Adding Raul Garcia to the front line made life very difficult for the Real Madrid defenders, and they started getting quite narrow. This is where Marcelo could’ve helped out, but was too often out of position, making the duel on the right hand side a one v one between Juanfran and James. Unsurprisingly, Juanfran won a lot of the battle going forward, even causing Sergio Ramos to often leave his position. Both sides looked to crosses as a goal scoring option. While Real did well in the first half, with a few deep balls from the left, and Bale getting behind with his speed and dribbling a couple of times on the night, Atletico were able to stave them off, with some discomfort. Pretty much the same could be said of Atletico’s attempts going forward, with Juanfran giving the likes of Mandzukic something to feed off. Going into the leg at the Bernabeu, the tie is on a knife edge. While Atletico aren’t going in with any advantage, Real don’t have an away goal either. Plus, Atletico have the head to head record in their favour for this season, which should make it interesting. Expect more of the same from Atletico in the next leg. Tight defending, and aggressive attacking, especially from the set pieces is what Simeone is probably targeting. 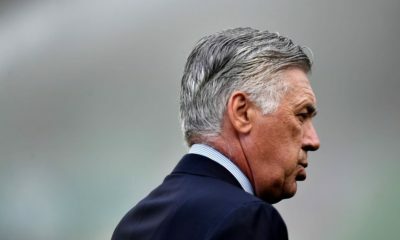 What’s more interesting to see is Ancelotti’s reaction. While the team did put forward a good performance, forcing Oblak into a number of good saves in the first half, he will be vary of Atletico’s threat on the break, and therefore conscious about over committing. Don’t be surprised if we see this one go into extra time, and maybe even a shootout.